My family and I took a trip to northeast Kansas to visit my grandmother for her 90th birthday. While there, I thought I would check out the local barbeque scene. A quick Google search of the area led me to Iron Horse BBQ in Atchison, (not to be confused with Iron horse BBQ in Arkansas or Georgia or a company that makes train shaped smokers.). Gotta love the train theme. After visiting with the employees, I learned that Iron Horse BBQ has been open for a few years and is the only barbeque restaurant in town. It was located in a cool old downtown building close to the Missouri River. I have to give this place extra credit for atmosphere because it is the only train themed barbeque joint I have ever seen in Kansas. The smell of wood smoke wafted to nose as I walked through the front door, which I always consider to be a very good sign of what is to come. 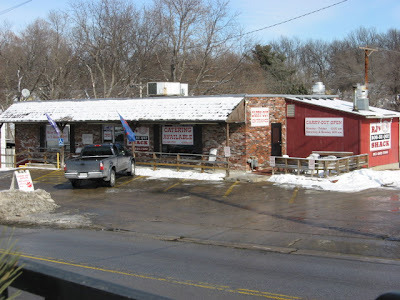 I would characterize Iron Horse as a Kansas City style barbeque restaurant due to the smoky flavor of the meat and the sweet homemade sauce choices. While I certainly prefer my barbeque to have much more flavor from a good quality rub, I would probably give this place a second chance. The prices are hard to beat. My kind of value menu. For around $25 I picked up a family platter with ribs, sausage, fries and several smoked meats. This was a real feast, and a bargain at that! The waitress also told me about amazing rib specials that can be had on the weekends and I will undoubtedly be there for a taste of their rib special the next time I am in the area. This weeks giveaway is very inspiring, we hope you find it inspiring also. To enter to win this porktastic plastic drink tumbler/travel mug, respond to the question below by Thursday, March 24 at 2 pm CST. Easter is right around the corner and we know you have a great ham recipe or two. What is your favorite Easter ham recipe? My latest quest for unique places and ways to eat pork around Kansas brought me full-circle, back to a place I’ve known before called “RJ’s Bob-Be-Que Shack” in Mission, KS. 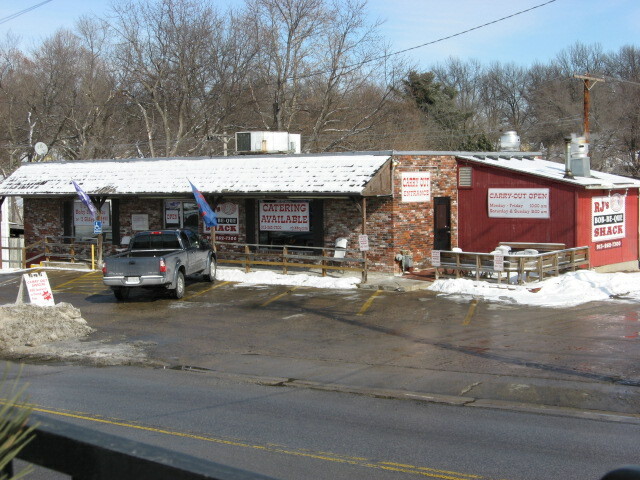 “RJ’s” sits at the intersection of Lamar Ave. and Johnson Dr., and actually happens to be one of the first non-chain BBQ places I ever ate at in Kansas City, so in a way, it can be blamed for my love of all things barbeque! “RJ’s” owner Bob Palmgren, trained in French cuisine, has made it a point to think outside the barbeque box, while remembering to do the traditional barbeque foods their justice at the same time. The latest idea-turned-food to come from his kitchen (and the one that brought me back to RJ’s) is the “Jalapeño Sausage”. 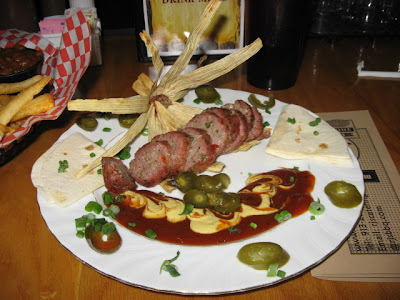 The sausage is such an interesting specimen that it ended up being featured in an episode of “Diners, Drive-Ins, and Dives” hosted by Guy Feiri on Food Network. The basis for the sausage recipe is ground pork that is mixed with chopped jalapeños and garlic, along with many other spices. If that’s not enough for you, it is then put into corn husks (like a tamale) before it is smoked to perfection like any good barbeque meat should be! 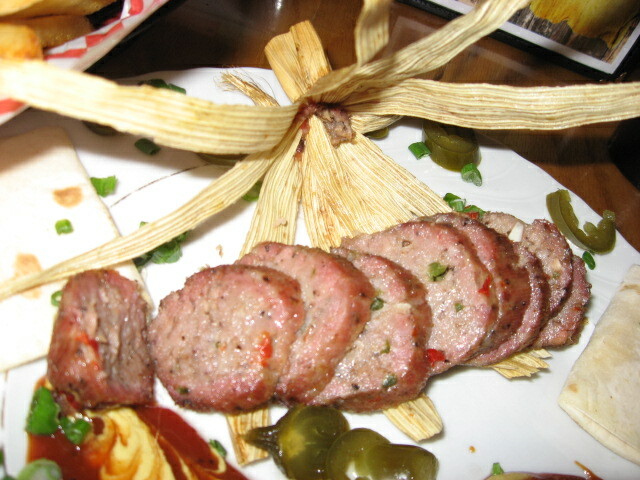 I, like Guy Feiri, was blown away by the near perfect combination of texture and flavor the sausage had to offer. The jalapeño and garlic went very well with the general flavor that comes with smoked pork sausage. I tried it with, and without BBQ sauce, and found it equally good each way. Also, the fact that it is smoked in a corn husk gives it even more layers of greatness! The whole plate, as you can see in the picture, is really quite a work of art, and simply put, it tastes as good as it looks! Whether you want to try the jalapeño sausage, or you simply want some ribs or a pulled pork sandwich and fries, RJ’s Bob-Be-Que Shack has it all. Conveniently, RJ’s is also fairly accessible, as there are two good ways to get to it from I-35. You can go south on Lamar Ave. from I-35, or go east on Johnson Dr. from I-35. They also have an amazing looking breakfast menu that they pull out for Saturday and Sunday only, so keep that in mind if you’re in town for a weekend. Since everyone really seamed to like last week’s giveaway with the cutting board, we thought we’d give another away. Answer the question below before 10 a.m. on Tuesday,. March 15 for a chance to win a pork cutting board. See a pic of the cutting board here. Question: Have you check out pork’s new website www.porkbeinspired.com? What is your favorite pork picture or video?